I love Dalí, but I'm not sure if I love his paintings, or if I just love him. He's one of those figures who is so ridiculous, you just can't help but like him. Also, his gravity-defying mustache makes him a winner. 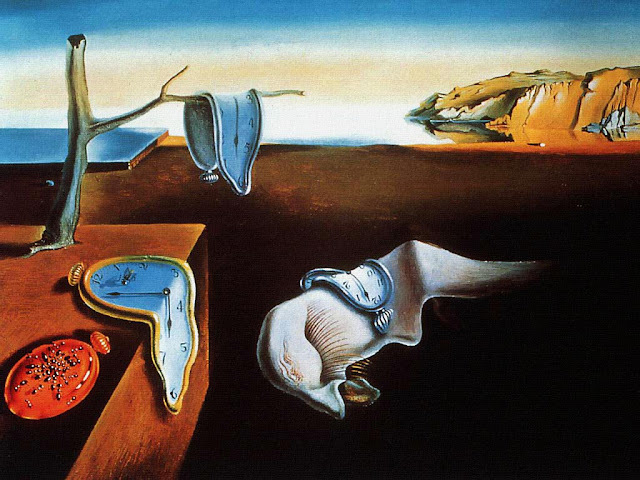 After Pablo Picasso, Dalí is probably Spain's most famous artist, best known for his work The Persistence of Memory, often referred to as "that painting with the melting clocks." There was a giant mural of it in my high school, so after seeing it every day, it's one of my favorite paintings. Do I have any idea what it means? Nope. But the melting clocks are fascinating. Dalí was a surrealist, so he was into abstract ideas and images that weren't grounded in the real world. A few weeks ago, I was lucky enough to visit the Dalí museum in Barcelona, Spain, where I got to see (and even touch, when it came to sculptures) some of his lesser known works. To the left, you'll see Automobile Giving Birth to a Blind Horse Biting a Telephone. (Sorry for the poor quality photo, but photography isn't my strong point). Not sure what it means, if it means anything at all, but I think the title is hilarious. Also, very straightforward. Look familiar? Dalí had quite a few obsessions, or so I gathered from my visit to the museum: horses, rhinoceroses, and melting clocks. The melting clocks are definitely what interest me most. Time melting away…Very cool. Also, interesting tidbit: the 20s (during which Dalí worked) marked the beginning of the world's obsession with time and prolonged youth (think works like Twilight Sleep or Tender is the Night). It's when time phrases became an essential part of our vocabulary: kill time, keep time, out of time, etc. So I have to wonder if Dalí, who finished The Persistence of Memory in 1931, was commenting on this phenomenon. He was also fascinated by horses, apparently. An entire room of the museum was dedicated to his paintings and sculptures about horses, many of them from famous stories. This painting features Don Quixote and Sancho Panza. One of Dalí's paintings would be awesome inspiration for a picture prompt. I would love to read a story, or even a full length novel, based on The Persistence of Memory. Even just a world based on it. Who knows? Maybe one day I'll try my hand at writing it. Oh Dalí...he probably threw the best parties. Definitely better than Tyco Brahe. Anyone is better than Tyco Brahe when it comes to partying. But yeah, Dalí was probably great. Dalí + Hemingway = probably better. Basically why isn't Midnight in Paris my life? Barcelona is really cool for architecture and art. Unfortunately I was only there for two and a half days, so there's still so much I haven't seen! Though the Dalí museum was definitely a highlight. Great post - might take you up on the challenge. Have you seen Hitchcock's "Spellbound?" A great dream sequence designed by Dali. No, I haven't. Though I have seen the short "Destino" that was designed by Dalí and Walt Disney.